Are you looking for a romantic and tranquil escape in Andalucía, surrounded by the most idyllic and inspiring of landscapes? If so, then let us take you near to the picturesque whitewashed inland village of Algodonales and through the doors of Casa Rustica. Casa Rustica is a quirky, comfortable and delightfully rustic – hence its name – 1-bedroom, 1-bathroom country home that’s nestled on a hillside and boasts panoramic views of mountains, olive-covered hills and a lake. This pretty stone cottage boasts an array of eye-catching natural features, included exposed stone walls, both internally and externally, traditional tiles underfoot, a fireplace and wooden beams overhead. Picture windows not only let swathes of sunshine filter into the cottage but ensure the incredible vista that surrounds Casa Rustica at every angle can be enjoyed to the maximum. The cobalt waters shimmering under the sunlight of the Embalse de Zahara can be seen in the distance, backed by the unmistakable peaks of the Sierra de Grazalema. Rolling towards the lake and mountains is a sea of undulating hillsides carpeted in olive trees. This enthralling scene can also be soaked up from Casa Rustica’s private pool and open and covered terraces flanked by the cottage’s extensive grounds littered in olive trees. 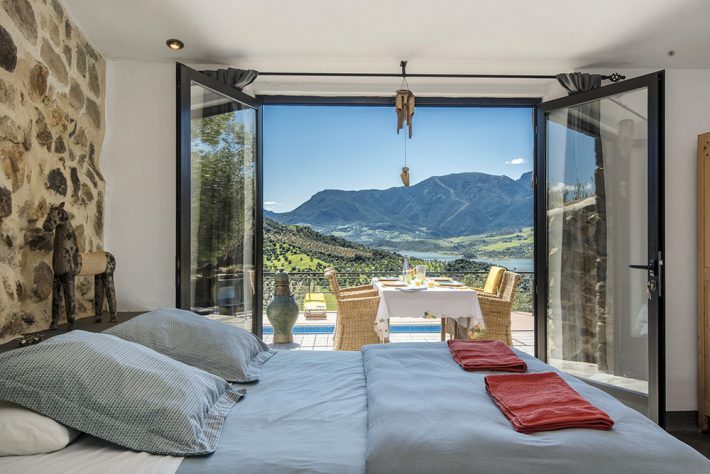 Guests can truly switch off and relax at this idyllic rural retreat and leisurely explore the many delights on their doorstep in this unique and mesmerising part of Andalucía. The pretty ‘pueblo blanco’ – whitewashed village – of Algodonales can be reached down a country lane, just 2km from Casa Rustica. The lakeside village of Zahara de la Sierra is 7km from the cottage. This quaint little town has all the hallmarks of a fairy-tale Spanish village burrowed on a hillside overlooking the turquoise lake with a crumbling castle perched at its pinnacle. The larger whitewashed town of Ronda is a 35-minute drive from Casa Rustica, famed for its plunging gorge, Moorish architecture and legendary 18th century bullring. To check availability, drool over the photos and book to stay at the incredible romantic Casa Rustica, head to the property’s webpage here.